People start out for many reasons, but ultimately, they end up continuing their use because they become addicted. They are addicted to nicotine, not the chewing tobacco, dip, pouches, snuff, snus or any other ingestion method, they are addicted to nicotine. Chewing tobacco comes as long strands of loose leaves, plugs, or twists of tobacco. Pieces, commonly called plugs, wads, or chew, are chewed or placed between the cheek and gum or teeth. The nicotine in the piece of chewing tobacco is absorbed through the mouth tissues. The user spits out the brown saliva that has soaked through the tobacco. 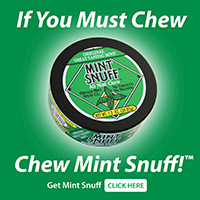 Moist snuff is used by placing a pinch, dip, lipper, or quid, between the lower lip or cheek and gum. The nicotine in the snuff is absorbed through the tissues of the mouth. Moist snuff is also available in small, teabag-like pouches or sachets that can be placed between the cheek and gum. These are designed to be both “smoke-free” and “spit-free” and are marketed as a discreet way to use tobacco. Snuff also comes in other forms. Snus (sounds like snoose) is a finely ground form of moist snuff made of air-cured tobacco, water, salt, and flavorings that first came from Sweden and Norway. Snus is most commonly packaged in small pouches, but can also be used like loose moist snuff (see the section “More on snus”). Tobacco companies have now created dissolvable forms of smokeless tobacco. Some that are sold or are being test-marketed include tobacco lozenges, tablets (orbs or pellets), strips, and sticks that contain tobacco and nicotine. Depending on the type, they are designed to be held in the mouth, chewed, or sucked until they dissolve. Some of these new smokeless tobacco products are mint-flavored and look like candy. Others look like toothpicks or meltaway mouthwash strips. Because they are so tempting, they can easily poison children and pets. Data collected in 2011 showed that about 3.2% of people aged 12 and older in the US used smokeless tobacco — that’s about 8.2 million people. Use of smokeless tobacco was higher in younger age groups, with more than 5% of people aged 18 to 25 saying they were current users. Although flavorings are not allowed in cigarettes, the tobacco industry offers sweeteners and flavorings in smokeless tobacco. It can taste more like candy with flavors such as vanilla, mint, and fruit, which makes it more appealing to young people. In fact, a 2012 study showed that most smokeless tobacco users chose mint or wintergreen flavored products. In 2003, more than 1 in 3 major league baseball players used smokeless tobacco, mainly moist snuff, and many still do today. Athletes are a large marketing source for smokeless tobacco, and are often seen on TV using it during a game. As role models, they can influence youth to be more open to and accepting of smokeless tobacco. State-enforced smoking bans are a more recent influence on the use of smokeless tobacco. In response to these bans, tobacco companies have been marketing smokeless tobacco products more heavily. They are advertising smokeless tobacco products as alternatives to cigarettes in places where smoking is not allowed. When smokers use these products as substitutes instead of trying to quit tobacco, it continues to support the tobacco industry.